This has to be one of my new favourite story books that I have discovered – Inky’s Great Escape is all about an octopus escaping from an aquarium and is based on the true story of an octopus in New Zealand (with some creative magic included). Inky is an octopus who shares his tank with Blotchy (a slightly grumpy octopus) and the two seem to enjoy their days playing card games and telling tales. But Inky is an escape artist and after a while he gets bored in the tank and decides he needs some adventure. So he plans his escape………………. This is a magical story and I think most kids will love it. My son enjoyed the story especially the conversations between the two octopus friends and the idea of an octopus escaping out of his tank really captured his imagination. The fact that it is based on a real story was just the icing on the cake and we had some fun looking for clips of real octopus escaping through small gaps (unfortunately the actual event that this was based on was never caught on camera). We both thought the story was well written and loved the stunning illustrations. For a fun story book this ticks all the boxes and as a home-educating mom I think the story could be a great starting point for some fun sea creature learning activities. I thought this Octopus Anatomy page from Education.com was great. They also have this fact sheet. (Education.com do have a subscription but you can also create a free account and download a limited number of free worksheets each month – I think it is 10 free ones a month). 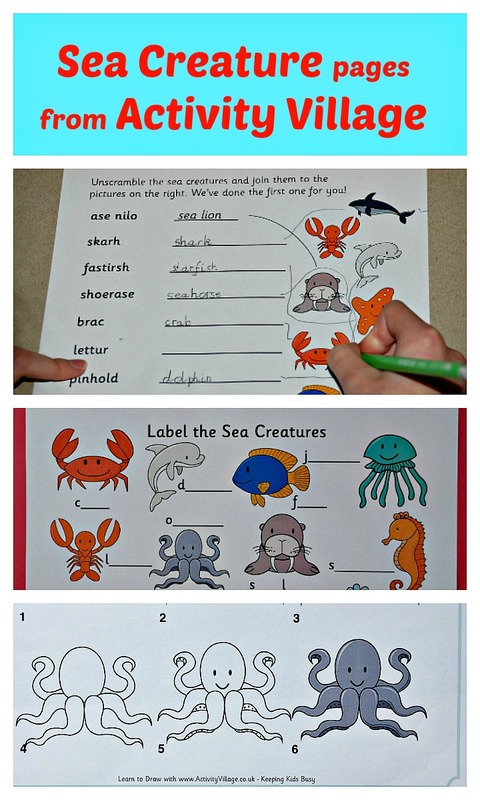 And if you have Activity Village membership (think it is currently £15 a year) we liked the Sea Creature Word scramble. I like using the word scramble pages as a fun way for the kids to practice their spelling. And the Label The Sea Creatures pages. I really liked that there are three different versions of this page – one with just a few letters of each word missing, one with only the beginning letter of each word and one where there is just a blank line. And they also have a Learn to Draw an Octopus Page (as well as a number of other sea creature drawing pages). And an Octopus Acrostic Poem page. I was given a copy of Inky’s Great Escape by the publishers but the book is now available from Amazon Inky’s Great Escape . I have included an Affiliate link. If you follow an affiliate link and go on to purchase that product, I will be paid a very small commission, however your cost will remain the same. I only include affiliate links for products that we use and love. 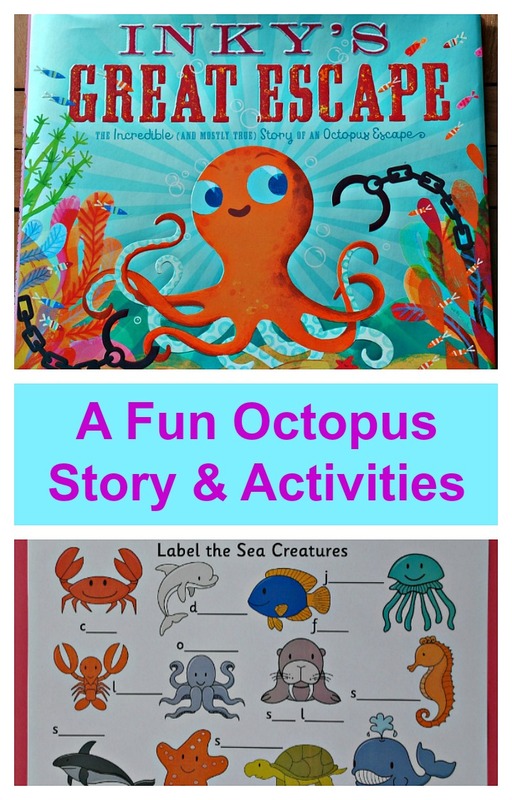 This entry was posted in Book Ideas and tagged activity village, children's book, home ed, home education, homeschooling, Inky's Great escape, Octopus. Bookmark the permalink.